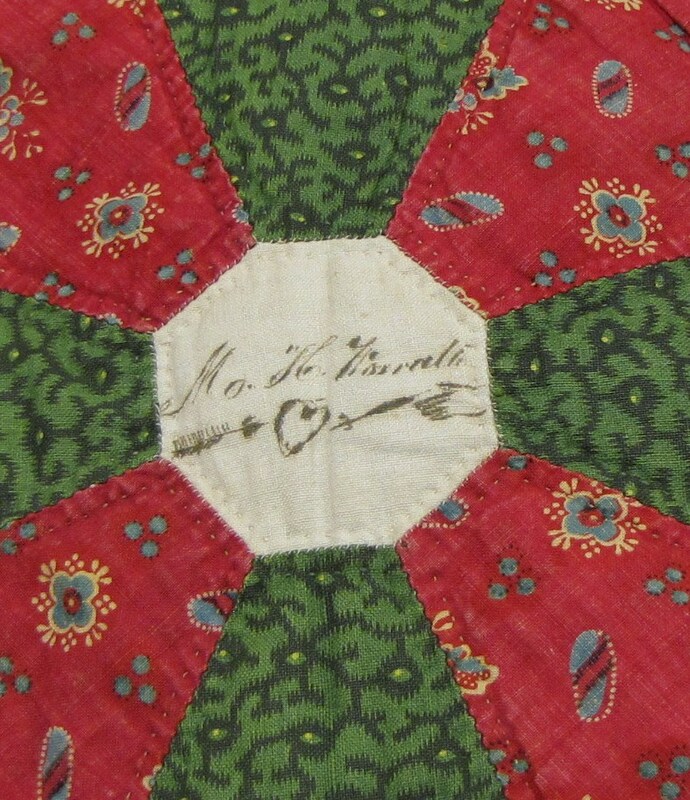 Here is a special Valentine's Day preview of my new quilt- with 2 very valentiney blocks. Don't you love the hand throwing the arrow at the heart? There are several blocks with hearts and other wonderful little drawings. 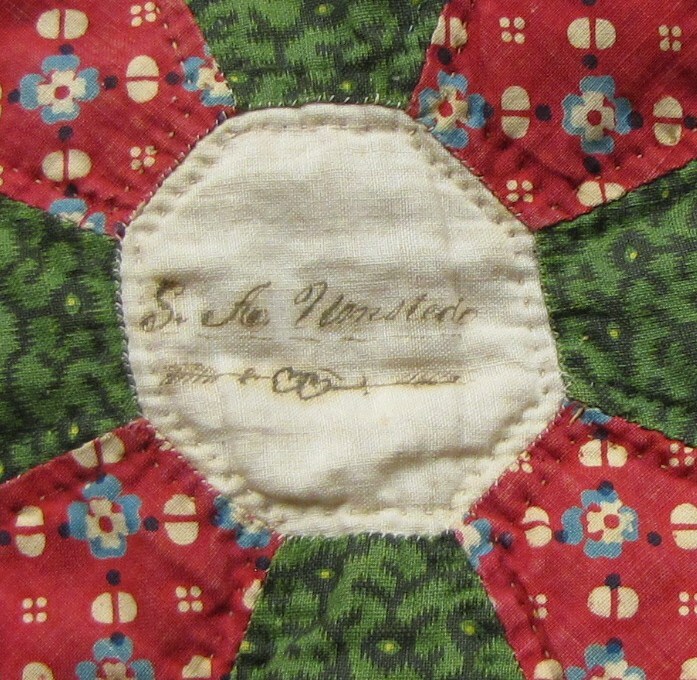 It is a dated 1850 Quaker friendship album quilt from Chester County Pennsylvania. From the Worrall, Hoopes, Davis, Windle, Umstead, Hicklen, families. Here is a full look at the Umsted block to further whet your appetite. 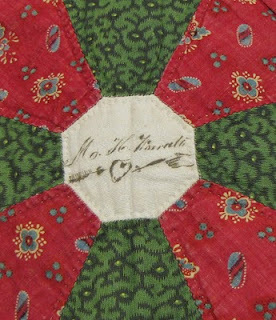 And here is another valentine to my readers: the 4th block in my reproduction of the 1845 crib quilt along with the original antique block. I'm reproducing it for the Alliance for American Quilts 2011 Challenge. 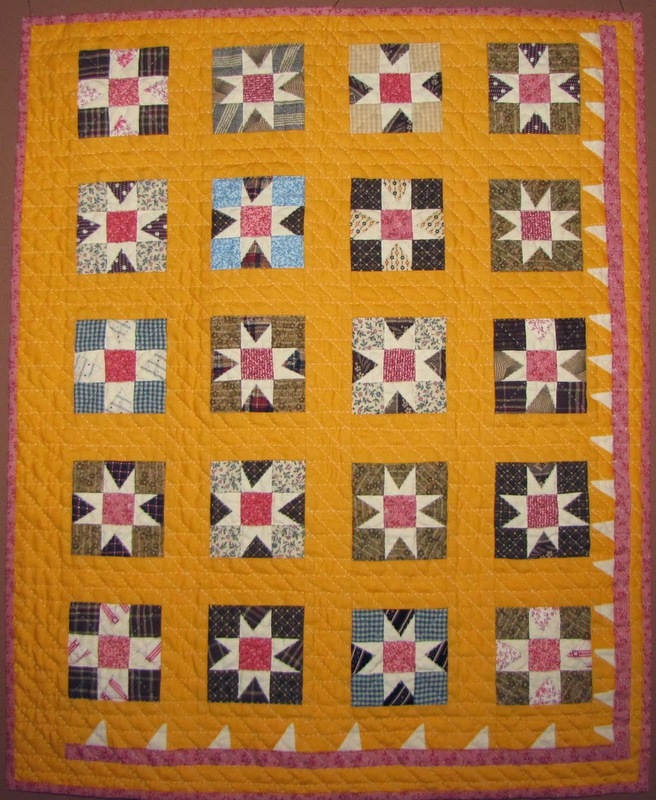 Scroll down to my previous entries to see the other 3 blocks and the original blocks and also the full quilt. Now onto the hand quilting. 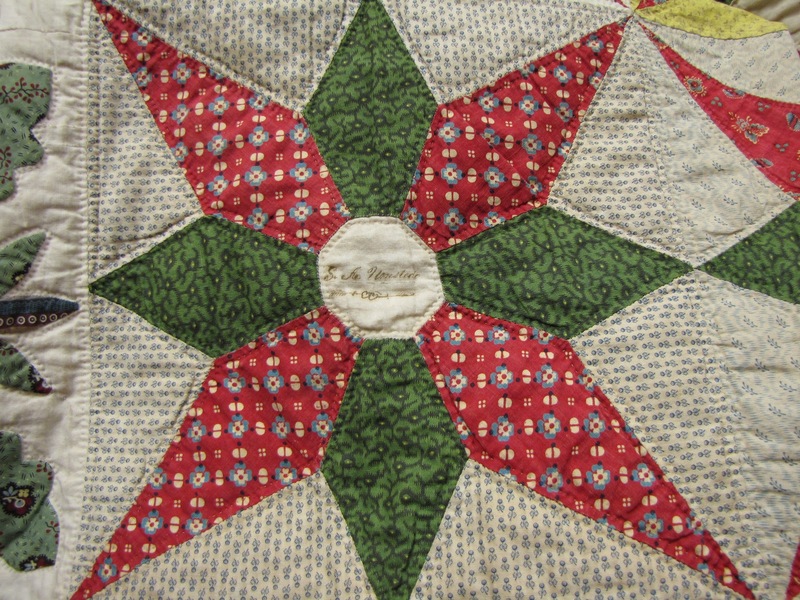 Here is the 3rd block in my reproduction quilt for the Alliance for American Quilts challenge. This little wreath was quite annoying (one of those blocks that has you looking longingly at the fusible or the shredder). Very fussy applique, the old fashioned way. I've already posted the original block, so you'll need to scroll down or click here to see it. Several people have asked about the light blocks that are hard to see, they are done in a faded tiny yellow print. Here is the first block of the quilt, enjoy. 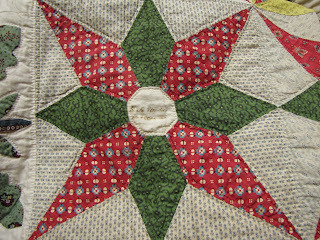 Here is the second block in my reproduction quilt for the Alliance for American Quilts 2011 challenge. Don't you just love how the bird is about to get shot by the giant cupid's arrow? Very quirky. And the formal floral urn squished in the corner- what was she thinking? 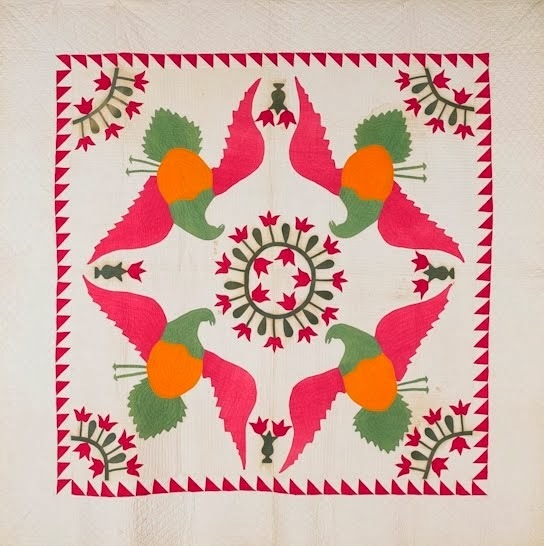 Don't forget to click on the photos to enlarge and see detail ... especially the fabric with birds on it that I used for the bird applique. Please see the previous 2 posts to see my first block and the full picture of the original c. 1845 crib quilt from Virginia. The original blocks are about 9" and the repros are bit under 7". The little fussy needleturn applique is tricky but also kind of fun. Here is the original block, it is very fragile, not sure why it is so much weaker than the other blocks. It has been interesting to reproduce the blocks in a similar but fresher look. I had fun picking out and fussy cutting the bird fabric. I generally try to do as exact as possible repros and would have used solid 'stained' muslin, etc. Not sure which look I like better. What do y'all think? Thanks for visiting.